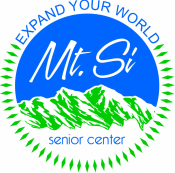 Join us to support seniors and the programs and activities at Mt. Si Senior Center. For those seniors who have given so much, it’s our turn to give back. Many of the seniors who use Mt. Si Senior Center are from the Snoqualmie Valley of old. Many have lived in the Valley for most of their lives. Most worked locally and supported only local businesses, owned and operated by their neighbors and friends. Many were schooled in the Snoqualmie Valley as were their children and in some cases their grandchildren. Their tax dollars have supported the Valley through its many changes. They volunteered, they participated and cared for the community we call home. Most believed they saved enough for retirement; the reality is many of our seniors that utilize the Center are on Medicaid.